The first snake seen this day, in the area around Bagdad, Arizona, was this whipsnake. It saw me first and fled, but seemed ‘stuck’ in the bushes. 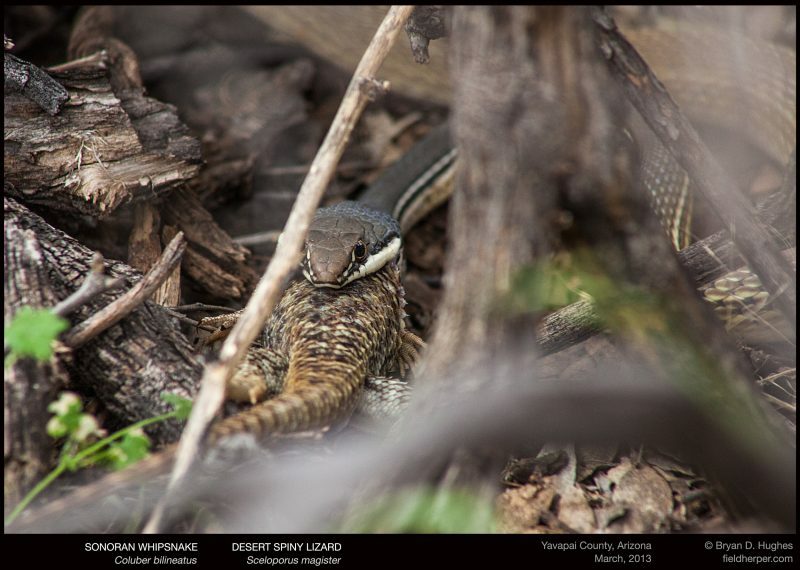 I backed off immediately and approached again slowly, and saw why it was not able to quickly navigate the underbrush: a large spiny lizard sticking out of it’s mouth! Even while stressed by my presence, it was taking it in. I was able to get this single shot between the branches. This entry was posted on Wednesday, December 28th, 2016 at 4:06 pm	and is filed under Behavior, Lizards, Snakes. You can follow any responses to this entry through the RSS 2.0 feed. You can leave a response, or trackback from your own site.